In 1999, the National Climate Centre adopted a “Seven-station Series” (7SS) as the basis of the NZTR. The stations (Auckland, Masterton, Wellington, Nelson, Hokitika, Lincoln & Dunedin) are geographically spread and considered to represent New Zealand as a whole. The 7SS graph and spreadsheet appear on NIWA’s website www.niwa.co.nz/news-and-publications/news/all/2009/nz-temp-record. 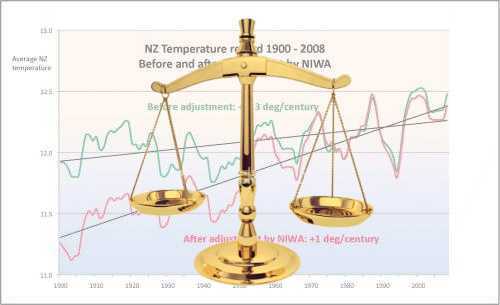 The NZTR is the basis of the advice given to legislators and officials in national, regional and local government agencies regarding past New Zealand warming and cooling. It is also used by international agencies such as the UN-sponsored Intergovernmental Panel on Climate Change (“IPCC”), which relied upon it for the Australia and New Zealand chapter of the Working Group 11 volumes of both its Third (2001) and Fourth (2007) Assessment Reports. Frequently, it has been the basis of expert evidence given to the Environment Court and other tribunals. The major significance of temperature records is their role in the “Detection and Attribution” aspects of climate science, as they form the basis of the theory that most warming in the twentieth century was human-caused, or ‘anthropogenic’. This hypothesis is wholly dependent on the warming trend figure being above that which could be expected from natural variations. If the record were to disclose a century-long warming trend of, say, 0.4°C, the anthropogenic forcing signal would be absent. NIWA’s 7SS discloses a warming trend of approximately 1.0°C during the last century. This is a very high figure and almost 50% above the global average for that period. Because there are very few long term temperature records in the Pacific Ocean, the New Zealand Climate Database bears heavily disproportionate weight in determining multi-decadal trends in global average temperatures. Shortly after its formation in 2006, the New Zealand Climate Science Coalition queried the basis of the 7SS, noting that it appeared to be seriously at odds with other records. The Coalition unsuccessfully sought access to the data and calculations behind the graph. In November 2009, the Coalition, with the Climate Conversation Group, published a paper – “Are We Feeling Warmer Yet?” – which disclosed that virtually all of the warming shown in the 7SS was derived from in-house “adjustments” made by NIWA. The paper is available at https://www.climateconversation.org.nz/docs/awfw/are-we-feeling-warmer-yet.htm. In response to the paper, NIWA issued a series of press releases contending that some “adjustments” were necessary when a measuring station was relocated, and providing a detailed example as being the difference in altitude between Thorndon and Kelburn, in Wellington. NIWA also released a new temperature graph, entitled the “Eleven-station Series” (11SS) of stations whose data had not been adjusted, claiming it showed a warming trend of 0.9°C over 77-years. This graph is now shown on the NIWA web page referenced above. During December, Hon Rodney Hide made a number of attempts in Parliament to obtain the 7SS data and calculations. Both Nick Smith and Wayne Mapp referred to the altitude difference in Wellington, and both Ministers tabled in Parliament multi-page papers discussing altitudes of Thorndon-Kelburn-Rongotai. On 21 December, the Coalition lodged a formal request under the Official Information Act. In response, NIWA eventually admitted that it held no record of its 1999 decision, but understood the 7SS had been sourced from a student thesis presented in 1981 by James Salinger. They further stated that the data and calculations were the private property of Dr Salinger. Dr Salinger was employed by NIWA’s National Climate Centre as Principal Scientist, responsible for climate records, until he was summarily dismissed on 23 April 2009. His appeal was determined by the Employment Relations Authority on 21 December 2009. In December, NIWA stated in written answers to Parliament’s Education and Science Select Committee that the adjustment processes of the 7SS had been peer-reviewed and published in a scientific journal. No such journal has been found. NIWA added two relevant documents to its website on 9 February 2010. One was described as a ‘Schedule of Adjustments’ but was a bare list of the SSS data adjustments, without supporting data or other justification. The other was a detailed account of the adjustments made to Hokitika. • For the period 1853-2080, the single source of the 7SS adjustments is an appendix to a VUW student thesis written by Dr Salinger, which has never been peer-reviewed or published, or available outside of the VUW Library. Dr Salinger claims sole copyright. • The data analysis for the thesis was undertaken on the VUW mainframe computer system, but was irretrievably lost when the the system was superseded about two years later. There are no copies and the analysis has never been replicated. • Climate science was in its infancy in 1980, and there were no internationally-accepted techniques for homogenising temperature data from different sites. The substantial body of literature which developed during the 1990-2010 period does not support the thesis. • Neither of the supervisors of the 1981 thesis were climate scientists. • In 1980, a paper by a senior New Zealand meteorologist (JWD Hessell), which was peer-reviewed and published in a reputable science journal, concluded that there was no evidence of New Zealand warming since 1930. The author found that the raw data overstated the extent of warming because thermometers had been affected by shelter, screenage and urbanisation. This directly contradicts the Salinger thesis. • The NIWA 7SS shows a warming trend of 1.0°C from 1900 to 2004, and this is the only time series used by NIWA for determining average New Zealand temperature. The linear trend was 0.71°C from 1945 to 1975, and 0.34°C from 1975 to 2009, indicating that more than two-thirds of the warming (and the only abnormal warming) occurred in the period covered by the Salinger thesis. • The upward slope in the 7SS graph is created by downward adjustments in the pre-1945 period, rather than by upward movements thereafter. Pre-1950, 21 adjustments were downward and only 5 went the other way. In 9 out of 10 of the affected years, the 7SS adjustments were such that they contributed to an upwards trend, whilst only 1 in 10 opposed that trend. • Altitude change was not the basis for the 7SS adjustments made to the Wellington data. Nor was it considered as an adjustment factor for any of the other six stations. • No NIWA employee has ever reviewed or approved the methods, rationale, calculation, or confidence levels of the adjustments in the pre-1980 7SS. There is no documentary or other record of the Salinger thesis or its 7SS adjustments ever being adopted, analysed, or even criticised by any NIWA staff (although NIWA applies ISO9002 standards, which requires full documentation of all decisions). • The update of the 7SS from 2007 to 2008, was undertaken by a NIWA Principal Scientist, peer-reviewed by two other Principal Scientists, and approved by the Chief Scientist. • The 2010-11 vote for Research Science and Technology is to provide for a project to “review” the Salinger thesis. The project is expected to involve 5-6 scientists working for about 6 months and the outcome will be reviewed by NIWA’s counterpart, the Australian Bureaux of Meteorologists (BOM). The methodology will be published in a scientific journal. In light of all this information, the Coalition’s solicitor wrote formally to the Chairman of NIWA, Chris Mace, requesting that the use of the 7SS be discontinued until a new and respectable NZTR might hopefully emerge from the review project. That request was declined. In May, a critique of NIWA’s NZTR efforts was set out in an article by Barry Brill entitled “New Zealand Climatology in Crisis” in Quadrant Online www.quadrant.org.au/blogs/doomed-planet/2010/05/crisis-in-new-zealand-climatology. Subsequently, a further article dealt with the serious deficiencies of the 11SS www.quadrant.org.au/blogs/doomed-planet/2010/06/nz-climate-crisis-gets-worse. Having read McShane & Wyner’s paper on the failure of statistical analysis of the hockey stick temperature graph, including a proper error analysis, I wonder what the error bars should be for the temperature record. Surely there should be error bars on the curve and they should be respectable given the adjustments required. Quentin, both sets of figures are available on NIWA’s web site: adjusted and unadjusted. What they refuse (or, more accurately, are unable) to reveal are the individual adjustments made to each site, the reasons for each of them and their estimate of the accuracy of both the readings and the adjustments. In other words, a perfectly ordinary, scientific description of their work.